I got a Robot for Christmas! There’s a robot now, roaming inside our house. You read it right. A robot. No, it’s not as technically advanced like the NASA Mars Rover, but it does explore the expanse of our whole floor. Nor it is an alien robot, like the Transformers that can disguise like an everyday machinery, but it does do household chore. Meet Flori (a.k.a. taga-linis ng floor), my new iRobot, Roomba Model 560, vacuum cleaning robot. It cleans our floor by itself and then goes back to its dock when it’s done. It even has a feature that it can be programmed to clean our floor on schedule, up to 7 times per week. Maybe they should add a feature that it would play some music too, instead of the hum-drum noise it emits, while it is vacuuming. After many years of wishing that “somebody” can takeover the mundane chore of cleaning the floor, which is my designated task since I was a boy (using bunot and floor wax) and that I carried over to this day (see previous blog here), finally my wish came true. I am really happy that I got this gift under my Christmas tree. I am not saying though that the manual labor of cleaning the floor has not given me any satisfaction. Or maybe it doesn’t, but it certainly builds character. Yes, it may be a little slow, as Flori takes about 20 minutes to clean one room that I can do in under 10 minutes, but I am not complaining at all. She can take her sweet time. And me? I can use that 10 minutes in doing something else – like blogging. She may not be as good in cleaning the corners and nooks, or under the furnitures, and other hard to reach spots, but then again, I don’t mind that at all. As long as she does not run amok and take over our house like an out-of-control runaway machine, just like the plot of so many robot or intelligent machine movies, I am content. Now if “somebody” could also clear the snow in my driveway for me, that would be really cool (I mean hot….or warm, as I would not be freezing my ears doing it, you know what I mean). Is it too early to make a wish list for next Christmas? A fully automated, industrial grade, robotic snowblower is definitely in my list. A GPS-guided, fully automated, self-propelled, robotic lawnmower would be delightful too. Santa? Santa? Are you listening? 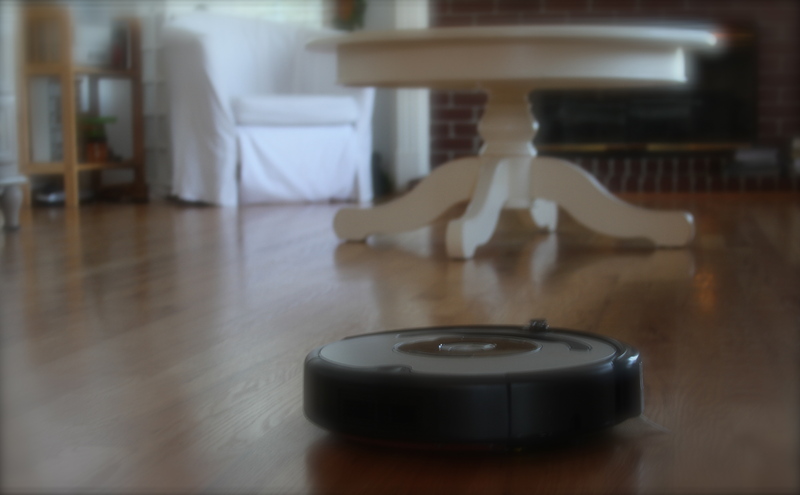 iRobot Roomba which provides superior performance for picking up pet hair, dirt, dust and more. However, easy to use and works pretty well. I just press the button and let Roomba do the work. Roomba covers every section of my house. It easily reach including under furniture, around everyday obstacles, along walls and under cabinets. It would also easily fit underneath many raised sofas, beds and coffee tables, eliminating dust and dirt from more places than a traditional vacuum cleaner. Its cleans a variety of surfaces including carpets, tiles, hardwood and laminated floors. Roomba 880 uses a powerful cleaning system to pick up an amazing amount of dustbin. So, i’m going to love this. You can collect your Roomba from this site that i given below.